National Hardware Door Roller, Series: V7602, Heavy Duty, Suitable For Use With: Residential Garage Doors, 1-7/8 in Roller Diameter, 10 Ball Bearing, 4-3/8 in Overall Length, Plain Steel, 7/16 in Shaft Heavy-duty galvanized steel lever mechanism to disengage side latches. 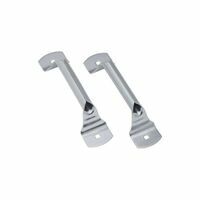 It accepts a 5/16" square shaft locking handle and fits Frantz and other garage doors. Short stem heavy-duty roller with steel inner race; 10 ball bearings. Contents: 2 roller assemblies. Roller 1-7/8" O.D.